DIE Jovis, 29 die Novembris. D. Bucks' Claim to the Title of Ld. Roos. 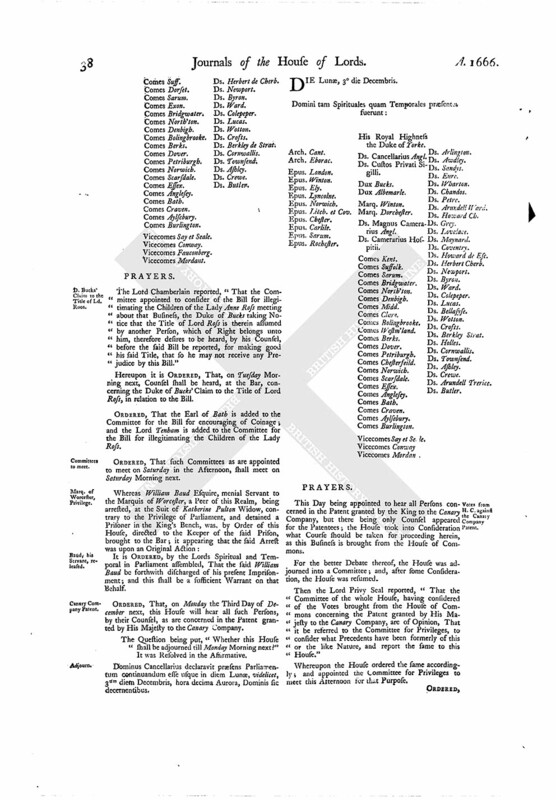 The Lord Chamberlain reported, "That the Committee appointed to consider of the Bill for illegitimating the Children of the Lady Anne Ross meeting about that Business, the Duke of Bucks taking Notice that the Title of Lord Ross is therein assumed by another Person, which of Right belongs unto him, therefore desires to be heard, by his Counsel, before the said Bill be reported, for making good his said Title, that so he may not receive any Prejudice by this Bill." Hereupon it is ORDERED, That, on Tuesday Morning next, Counsel shall be heard, at the Bar, concerning the Duke of Bucks' Claim to the Title of Lord Ross, in relation to the Bill. 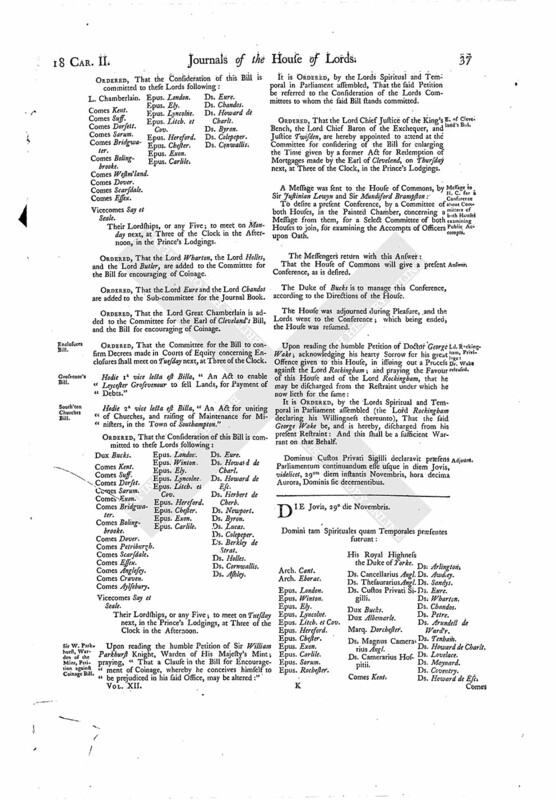 ORDERED, That the Earl of Bath is added to the Committee for the Bill for encouraging of Coinage; and the Lord Tenham is added to the Committee for the Bill for illegitimating the Children of the Lady Ross. ORDERED, That such Committees as are appointed to meet on Saturday in the Afternoon, shall meet on Saturday Morning next. It is ORDERED, by the Lords Spiritual and Temporal in Parliament assembled, That the said William Baud be forthwith discharged of his present Imprisonment; and this shall be a sufficient Warrant on that Behalf. ORDERED, That, on Monday the Third Day of December next, this House will hear all such Persons, by their Counsel, as are concerned in the Patent granted by His Majesty to the Canary Company. The Question being put, "Whether this House shall be adjourned till Monday Morning next?" Dominus Cancellarius declaravit præsens Parliamentum continuandum esse usque in diem Lunæ, videlicet, 3um diem Decembris, hora decima Aurora, Dominis sic decernentibus.